Olivia went fishing and caught an octopus! Who would have thought!?!? Do you enjoy reading to your little ones? Read them the story of Olivia and her pet octopus! The story is told in a fun 24 page coloring book so they can color and design their own unique book! Then use the fun patterns to make your own customized characters from the story. Pick your own fabric in their favorite colors to make the doll and her adorable pet octopus come to life! Sew much fun and interactive! - 1 PDF sewing pattern with instructions and pattern pieces to create a 19" rag doll. Instructions include step by step photos. - 1 PDF sewing pattern with instructions and pattern pieces to create a 10" plush octopus. Instructions include step by step photos. 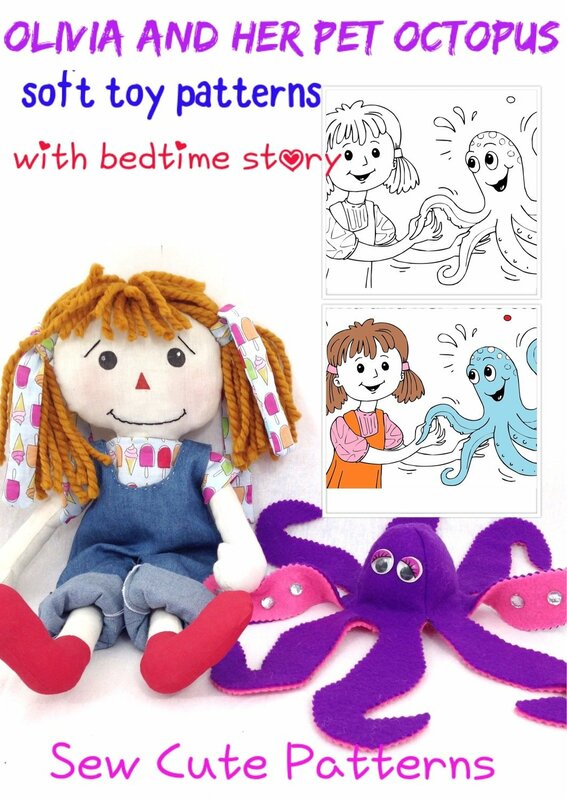 - 1 24 page PDF coloring storybook telling the story of Olivia and her Pet Octopus. The doll is made from muslin cotton fabric with yarn hair. The octopus is made from felt fabric.